COLDSTORE is a Network Attached Storage System (NAS) designed specifically for modern video surveillance systems which need very high capacity for mega-pixel IP cameras and/or long archive periods. DISKPLAY is a USB docking station designed specifically for connecting COLDSTORE disks to a PC via a simple USB connection for replay and review. DISKPLAY exploits the unique removable, playable disk feature of COLDSTORE. Whilst simple in concept and in use, the technology incorporated within COLDSTORE delivers a very high reliability system even when using the lowest costs disks available. 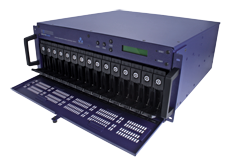 Our Linear Array of Idle Disks (LAIDTM) system combined with our unique Sequential Filing SystemTM(SFS) produces a powerfully simple system which provides massive capacities at very low cost. The system is extremely simple to manage, with all disk set up and configuration being entirely automatic. Thus even the end-user can add, remove, replace and even upgrade disks. These operations are done without ever stopping the recording of data. COLDSTORE exploits the fact that only 3% of video data is ever replayed, and so every disk is off (on average) for 87% of the time. SFS controls the disk read/write heads, moving them across the disk very much like a vinyl record player, virtually removing disk vibration. Combining LAIDTM and SFSTM together with a custom-designed low-power main CPU board results in a disk array which hardly needs any cooling at all, and uses as little as 40 watts even with a fully populated 45TB array. As there are special times when it may be necessary to run all the drives simultaneously for an extended period (e.g. during a mass search process), COLDSTORE is designed to handle this with ease, incorporating a well-specified power supply (with dual hot-swappable PSU option) and temperature-controlled chassis cooling fans. Even in this mode, COLDSTORE will use around 120 watts maximum - more than three times as efficient as typical RAID systems. COLDSTORE can use any make and size of SATA disk and indeed any mix of disks. Disks may be added "on the fly" and will automatically be incorporated into in the array. Disks may also be extracted at any time, and due to the strictly sequential writing pattern, the recorded time-span of any disk may be displayed on the front panel. This allows simple physical location (and extraction) of any particular recording for evidential purposes. Such simple, yet powerful features allow the disks in the array to be easily managed by the end users themselves. In addition to the mirrored overlapping-pair mode, COLDSTORE can also operate in single sequential disk mode and sequential mirrored-pair mode (i.e. sequential RAID1) as required. These modes of operation still benefit from the power-saving, low temperature, vibration and wear features of LAID and SFS, including simple disk management and instantaneous extraction of evidence. Veracity provides a simple SDK to DVR/NVR manufacturers who wish to provide their end users with the benefits of COLDSTORE. Direct control of COLDSTORE via a defined network protocol is an alternative method of integration. COLDSTORE is delivered with a full configuration and management application. Once configured, disks may be removed and extracted at any time without re-configuration. Array management may also be done directly via front-panel controls. 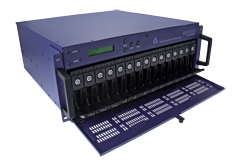 The front panel is also used to show array status, disk capacities, disk time span and IP address. [Find out more...] Veracity COLDSTORE "Technical Datasheet", 1.85 MB pdf file.